Puerto Rico's governor proposed a $25 billion budget to the island's legislature Tuesday in which retired government workers would keep their monthly pensions uncut and public school teachers and police officers would get pay raises. The budget also contains $25 million for a voluntary buyout program as the U.S. territory's government faces new austerity measures while it struggles to recover from Hurricane Maria amid an 11-year recession. "There are a lot of challenges to overcome, but I'm certain we are headed in the right direction," Rossello said during his annual budget address. The governor kept his promise not to implement a 10 percent reduction to the public pension system as sought by a federal control board overseeing Puerto Rico's finances. While the proposed cut to a system facing nearly $50 billion in liabilities might not be made in the upcoming fiscal year, it could come the following year. Rossello delivered his address two days after he reached a tentative deal with the control board to reverse its decision to eliminate a Christmas bonus and reduce vacation and sick days for public workers. In exchange, Rossello said Puerto Rico would adopt at-will employment for the private sector as part of an overhaul of local labor laws, including a new work requirement for certain people enrolled in a nutritional assistance program. "For those families ... who are thinking about leaving Puerto Rico, look at this budget deal as a first step for a new opportunity to stay here," the governor said. However, the deal with the board is still tentative because Puerto Rico's legislature first has to agree to at-will employment, in which employers would be able to dismiss a worker at any time without having to prove just cause. "In my opinion, it's bad," said Thomas Rivera Schatz, president of the island's Senate and a member of the governor's party. The budget submitted by Rossello also calls for a $50 million-a-year fund to help municipalities and a $25 million fund for scholarships to the University of Puerto Rico, which will see its undergraduate cost rise from $57 per credit to $115 by next year and then to $157 by fiscal year 2023. In addition to a $1,500 annual salary increase for teachers and police officers, the budget would slash an 11.5 percent sales-and-use tax on processed food to 7 percent starting in August. Rossello also said his administration would start renovating roads with $600 million in local and federal funds following Hurricane Maria, which caused overall damage estimated at more than $100 billion. He said Puerto Rico also has an additional $817 million to renovate homes and some $120 million to build new housing projects. However, Rossello said federal funds cannot be the only solution to Puerto Rico's economic problems, saying that statehood is needed. "It's a problem of civil rights that cannot be ignored, neither in Puerto Rico nor in Washington," he said. Rossello pledged his administration also would soon release long-awaited audited financial statements for 2015 and 2016 and noted that the $7 billion set aside for upcoming government operations is 22 percent less than the budget approved by the previous administration. Some criticized Rossello for not including budget cuts sought by the control board for the island's legislature and the office of Puerto Rico's representative to Congress. 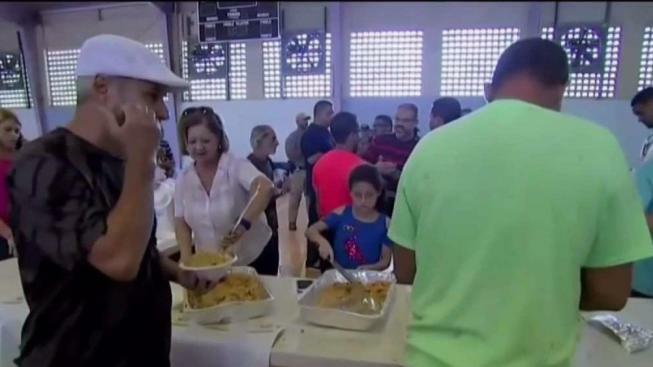 "The priority should be social spending, not political spending," Jose Caraballo, president of Puerto Rico's Association of Economists, told The Associated Press. He said federal hurricane recovery funds will help the island's economy grow in the next two years. "But it's not because we're truly doing better," he said. "The exit from this crisis will take longer than we think."